Thousands of members of the community took part in the "Maratha Kranti Mook Morcha" (Maratha Revolution Silent March) which also saw participation from socio-religious and political groups. 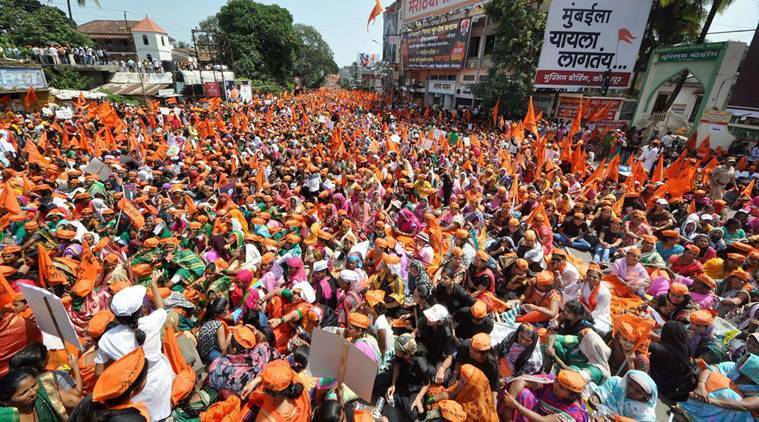 Members of the Maratha community on Saturday took out a huge “silent march” here in southwest Maharashtra in support of their charter of demands, including reservation, the latest in a series of such state-wide protests by the politically influential group. Thousands of members of the community took part in the “Maratha Kranti Mook Morcha” (Maratha Revolution Silent March) which also saw participation from socio-religious and political groups. Members of Parliament Sambhajiraje Chhatrapati, a descendant of Maratha king Chhatrapati Shivaji, and Udayanraje Bhosale from Satara also joined the march attended by people from Konkan, Belgaum (Karnataka), Sangli and adjoining areas. Chandrakant Patil, Maharashtra Revenue Minister, expressed solidarity with the community and briefly marched with others. Participation by a large number of women and college girls was one of the highlights of the event. Five girls met District Collector Amit Kumar Saini at around 12.30 PM and submitted a memorandum listing the demands, which included quota for community members in government jobs and education, scrapping of SC/ST (Prevention of Atrocities) Act and speedy trial in the Kopardi case wherein a Maratha girl was raped and murdered. Schools, colleges and shops remained shut and city buses were off the roads. Cinema halls cancelled their afternoon shows in support of the march. Member of Parliament Dhananjay Mahadik, MLC Mahadev Mahadik and former Maharashtra Minister Hasan Mushrif were some other prominent persons who showed up at the event.